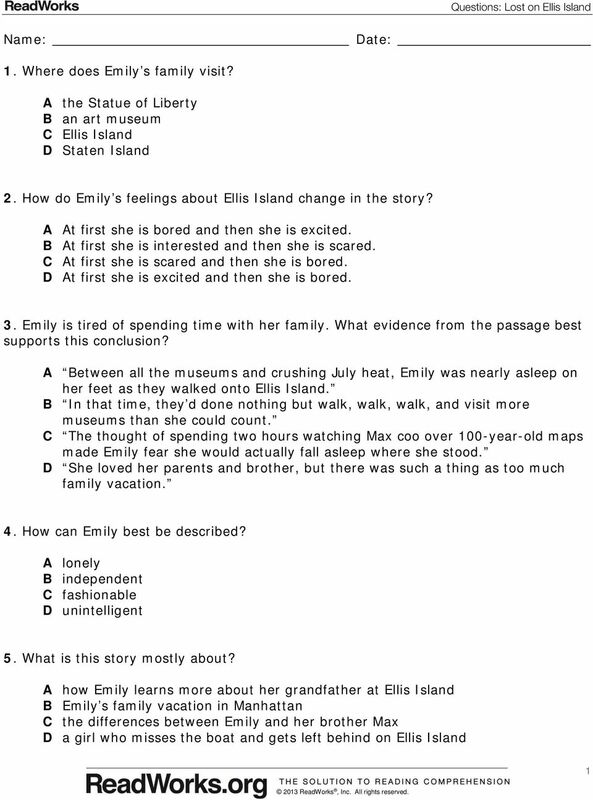 1 Lost on Ellis Island W.M. Akers To get to Ellis Island, you have to take a boat. From 1892 to 1954, many people came here from across the ocean. Millions of immigrants from Europe and beyond came to America through this tiny little island, where they were processed, checked for disease, and sometimes given a new, more American sounding name. Stepping onto Ellis Island was the end of a long journey, and the beginning of a new life. But for Emily Dalton, it was just another day on a family vacation. 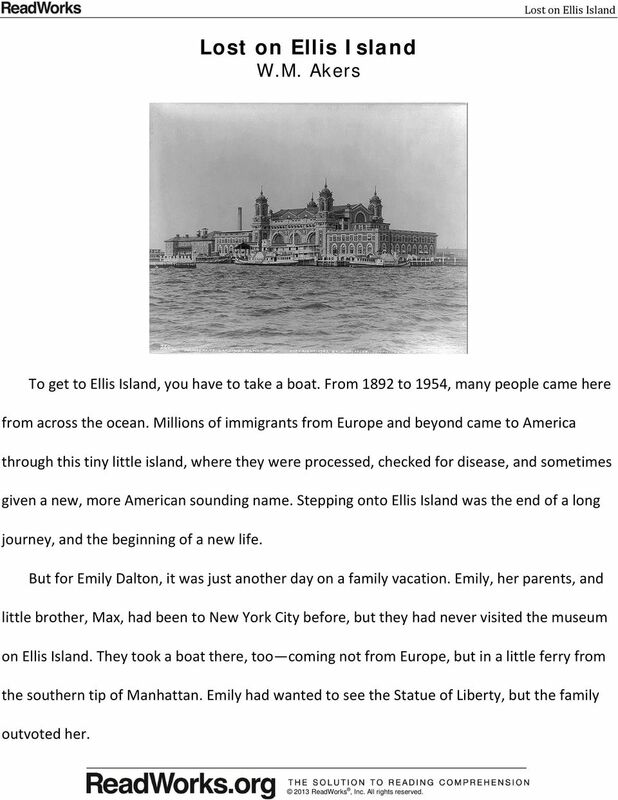 Emily, her parents, and little brother, Max, had been to New York City before, but they had never visited the museum on Ellis Island. They took a boat there, too coming not from Europe, but in a little ferry from the southern tip of Manhattan. Emily had wanted to see the Statue of Liberty, but the family outvoted her. 2 Think of it this way, Em, said her father. You can look at the Statue of Liberty on the boat ride over! Emily stared at the big green statue as their ferry docked at Ellis Island. More than anything else, she wanted to climb to the top of Lady Liberty and look at New York harbor from high up there. Instead, it was time to visit another museum. See you later, she said to the statue as they disembarked. Maybe next summer. 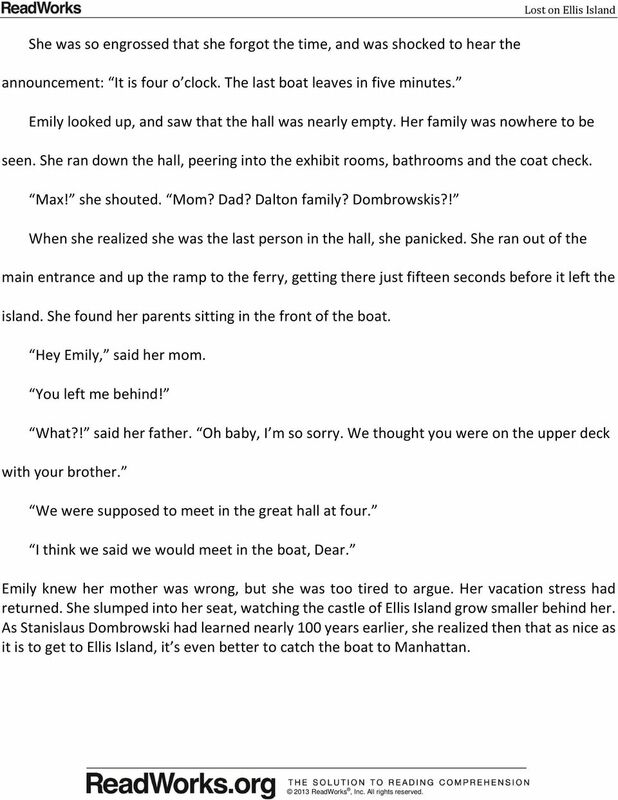 Emily and her family had been in New York for four days. In that time, they d done nothing but walk, walk, walk, and visit more museums than she could count. They saw art museums, science museums and history museums. There was even one, boring museum all about pieces of paper. 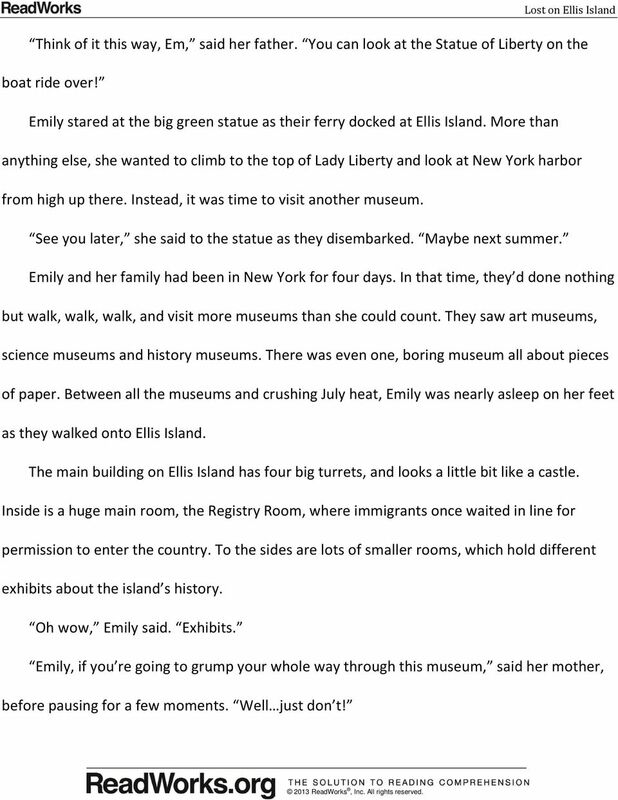 Between all the museums and crushing July heat, Emily was nearly asleep on her feet as they walked onto Ellis Island. The main building on Ellis Island has four big turrets, and looks a little bit like a castle. Inside is a huge main room, the Registry Room, where immigrants once waited in line for permission to enter the country. To the sides are lots of smaller rooms, which hold different exhibits about the island s history. Oh wow, Emily said. Exhibits. Emily, if you re going to grump your whole way through this museum, said her mother, before pausing for a few moments. Well just don t! 3 Oh my gosh, Dad! squealed Max. They have an exhibit all about maps! Max loved maps. Emily did not. The thought of spending two hours watching Max coo over 100-year-old maps made Emily fear she would actually fall asleep where she stood. You guys go on ahead, she said. I m going to poke around in the gift shop. Okay, said her dad. We ll meet you back here at four to take the last ferry back. Sounds great. As Emily s family walked excitedly toward the map room, Emily felt her chest loosen slightly. She loved her parents and brother, but there was such a thing as too much family vacation. 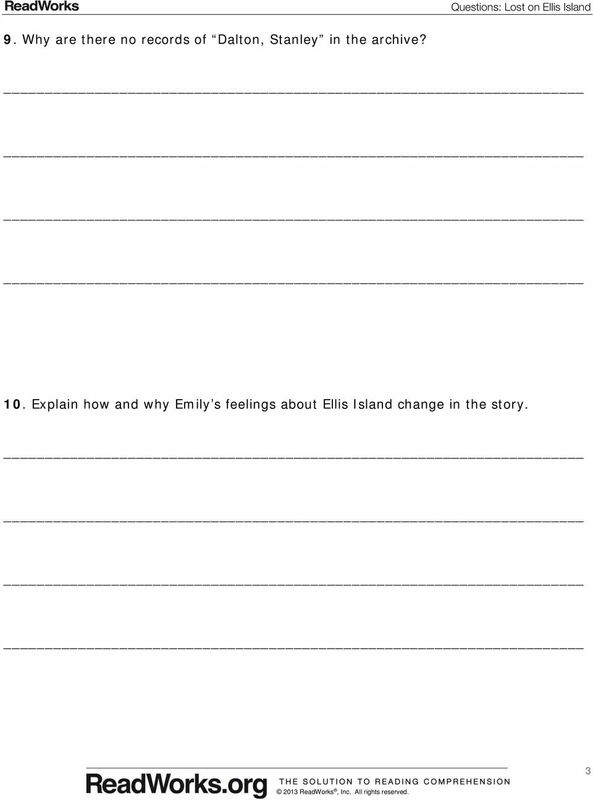 Now that she was by herself, Ellis Island didn t feel so bad. She was walking toward the gift shop, thinking about purchasing a new mug, when a machine caught her eye. The sign said Family Records, and it made something stir inside Emily s brain. She remembered two Thanksgivings ago, when her grandfather told the story about how he immigrated to the United States as a child. He was only seven years old, but he remembered standing in line in a long room in a building that reminded him of a castle he said Zamek back in Poland. I wonder if this is the same room! said Emily, as she began navigating the computer screen on the records machine. Without her family there, she was allowed to feel excited. She typed in her grandfather s name, last name first: Dalton, Stanley. 4 No records in the archive match your search, said the machine. Darn! said Emily. She was sure her grandfather had described Ellis Island. Wait a minute She remembered what her dad had told her about people s names being changed when they got to the island. The American government forced people to take new names, as a way of making them fit in better in their new country. Stanley Dalton wasn t a very Polish sounding name. That Thanksgiving, her grandfather had told them his given name. Emily bit her knuckle as she tried to remember. Stan Stanislaus Stanislaus Dombrowski! A name like that, Emily thought, you don t forget. She typed it in, and there he was! A picture of an old piece of paper came up covered in squiggly handwriting from January 12, On line 12, Emily found her grandfather: Stanislaus Dombrowski, whose name was changed to Stanley Dalton. He was from Warsaw, it said, and had never been to the United States before. He was seven years old, and in good health. There was information about his parents, too, and his younger sister. 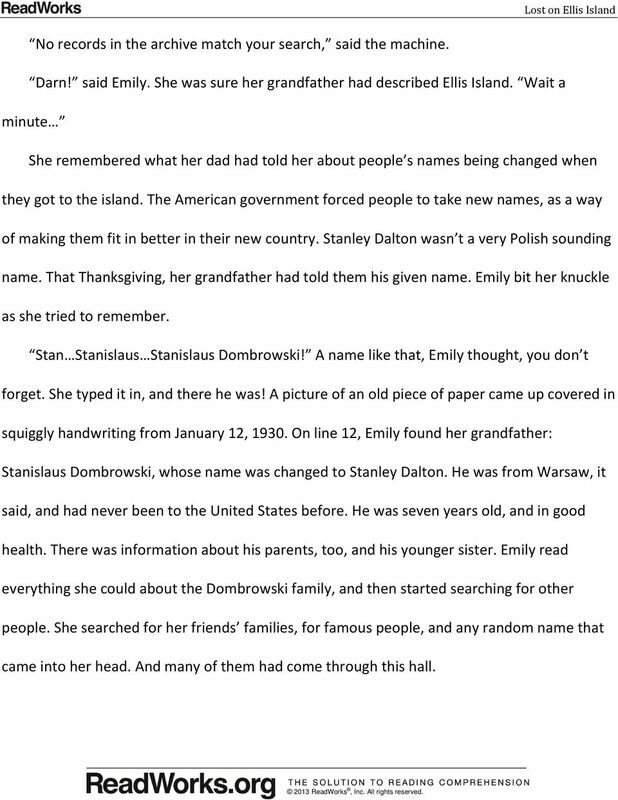 Emily read everything she could about the Dombrowski family, and then started searching for other people. She searched for her friends families, for famous people, and any random name that came into her head. And many of them had come through this hall. 5 She was so engrossed that she forgot the time, and was shocked to hear the announcement: It is four o clock. The last boat leaves in five minutes. Emily looked up, and saw that the hall was nearly empty. Her family was nowhere to be seen. She ran down the hall, peering into the exhibit rooms, bathrooms and the coat check. Max! she shouted. Mom? Dad? Dalton family? Dombrowskis?! When she realized she was the last person in the hall, she panicked. She ran out of the main entrance and up the ramp to the ferry, getting there just fifteen seconds before it left the island. She found her parents sitting in the front of the boat. Hey Emily, said her mom. You left me behind! What?! said her father. Oh baby, I m so sorry. We thought you were on the upper deck with your brother. We were supposed to meet in the great hall at four. I think we said we would meet in the boat, Dear. Emily knew her mother was wrong, but she was too tired to argue. Her vacation stress had returned. She slumped into her seat, watching the castle of Ellis Island grow smaller behind her. As Stanislaus Dombrowski had learned nearly 100 years earlier, she realized then that as nice as it is to get to Ellis Island, it s even better to catch the boat to Manhattan. THE TROUBLE WITH Written by Chad Schnackel & David Dalton Pages: 2+ Characters: Stacey, high school age girl Liz, 25+ Synopsis: Stacy has a history of trouble, but this counselor doesn't write her off. Greg the Grizzly Bear Greg the Grizzly Bear Hey, my best friend is a human, said Greg the Grizzly Bear, as he happily smacked on fresh salmon. What are you talking about? asked Barry the Grizzly Bear. How To Hear The Voice of God By Father Anthony Co. Hi, I m Father Anthony. today we re going to talk about how to hear the voice of god. A few years ago when I was in college, a certain motto came about in pop culture that infiltrated the lifestyles of much of the younger generation. YOLO was that motto, and it stood for you only live once. Part 10. Learning How To RETHINK Angry Feelings.